In July 2013, a trial excavation was conducted near Nazareth Junction, on both sides of Highway 79 (Permit No. A-6851; map ref. 227091–359/736970–7345; Fig. 1). The excavation, undertaken on behalf of the Israel Antiquities Authority and financed by Netivei Israel—the National Transport Infrastructure Company, Ltd., was directed by J. Vardi (field and studio photography), with the assistance of M. Shemer, O. Zidan and R. Liran (area supervision), Y. Yaakobi (administration), R. Mishayev and M. Kahan (surveying and drafting), Y. Roskin (geomorphology) and W. Atrash (scientific guidance). 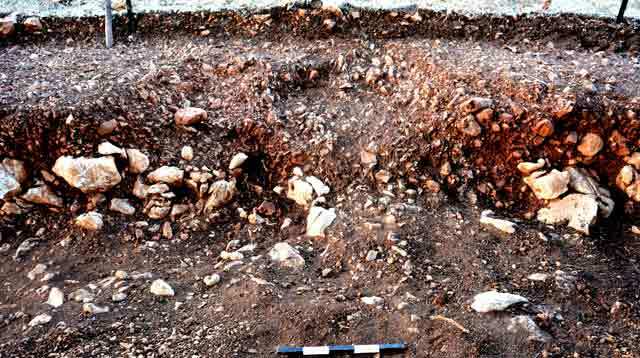 Two excavation areas (A, B) were opened on a gently sloping hill on the northern fringes of Nazareth. 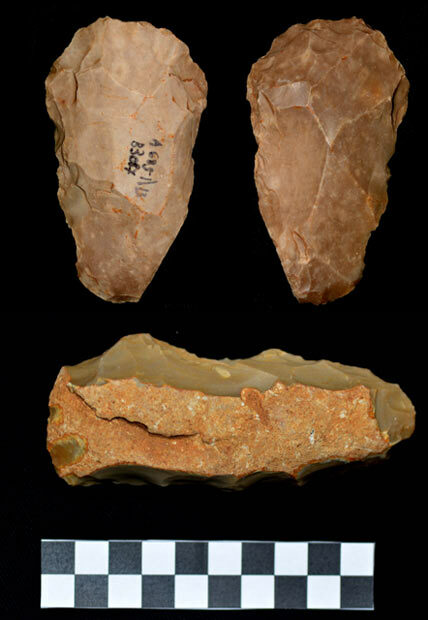 They yielded a wall (Area A) and bifacial flint tools dating from the late Pottery Neolithic period to the end of the Chalcolithic period (Area B). The site was identified in a preliminary survey conducted prior to the widening of the road (Khalaily and Marder 2009). 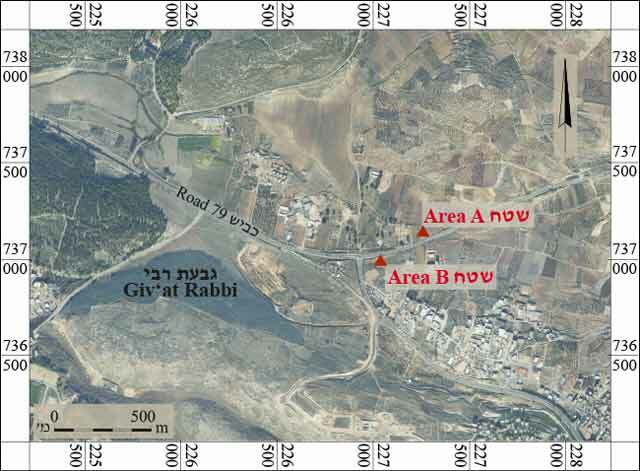 Previous excavations in the area surrounding Giv‘at Rabbi uncovered sites from the Middle Palaeolithic, the Pre-Pottery Neolithic B, the Pottery Neolithic and the Chalcolithic periods (Barzilai and Milevski 2010; Barzilai and Milevski 2015; Yaroshevich 2016). Area A. The area yielded a broad wall (W115; width c. 2.5 m; Figs. 2, 3) preserved to the height of a single course built of two rows of large fieldstones (average dimensions 0.3 × 0.4 m) encasing a fill of small and medium-sized stones and dark-brown clay soil. The north section of the wall was damaged, probably due to plowing. Only non-diagnostic flint artifacts were recovered; they bore signs of weathering and water abrasion, indicating that they were not found in situ. The wall may have been part of a structure or a path. Area B. Fourteen excavation squares were opened; six of them were evidently disturbed when earth containing ancient finds was removed to cover and level a neighboring plot. The remaining eight squares yielded well-preserved in situ flint artifacts. The artifacts, which were discovered in a layer of black clay soil (max. thickness 1 m; Fig. 4), included flint chunks—unworked raw material (Fig. 5)—flint-mining debris and flakes. 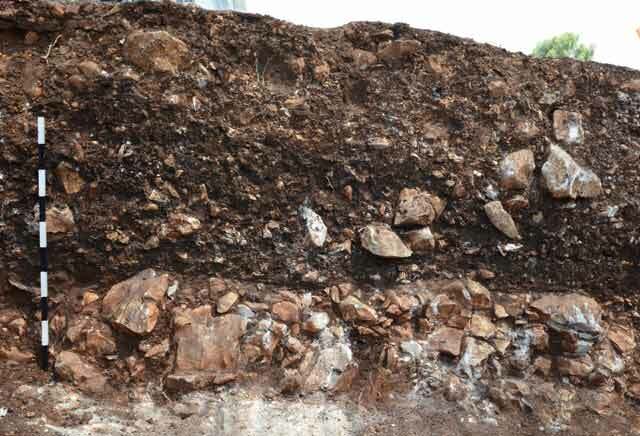 Above this layer was a layer of soil rich in flint artifacts (Fig. 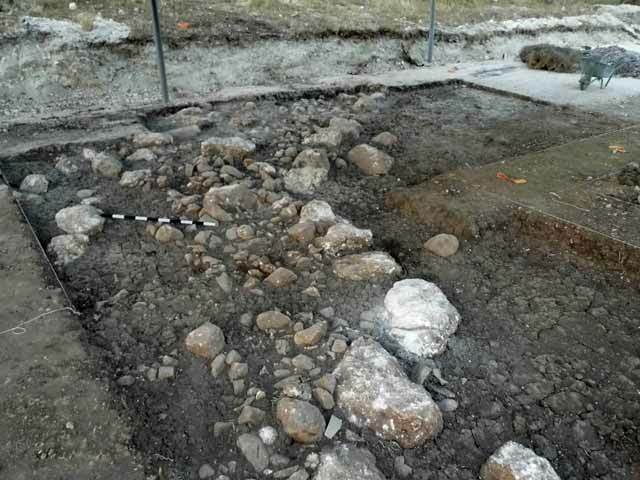 6) that was removed during mechanical clearance of the surface prior to the excavation. It included a pit with debitage (Fig. 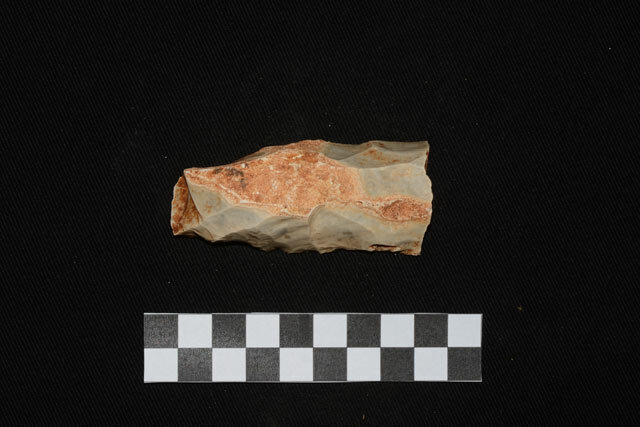 7) that yielded hundreds of flint items, mainly flakes and primary items, unfinished bifacial tools (Fig. 8) and tools that broke while being worked (Fig. 9). 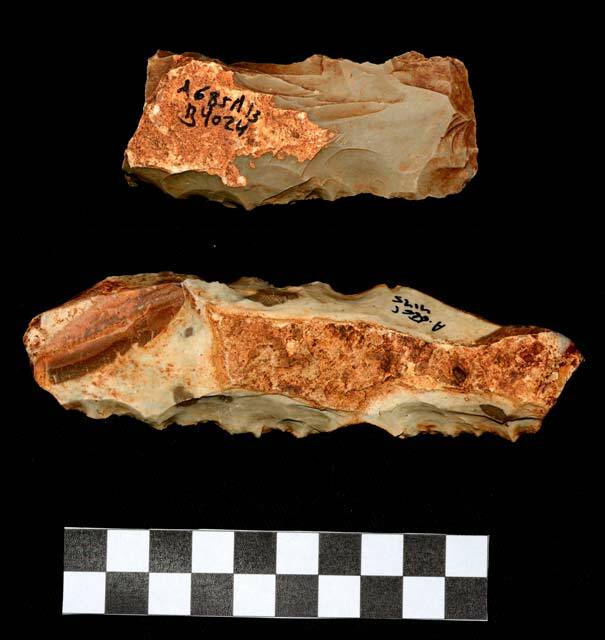 The finds comprised mainly adzes—bifacial tools with a flat ventral face and a convex dorsal face (Fig. 10)—dated from the late Pottery Neolithic period (Wadi Rabah culture) to the late Chalcolithic period (late sixth–late fifth millennium BCE). 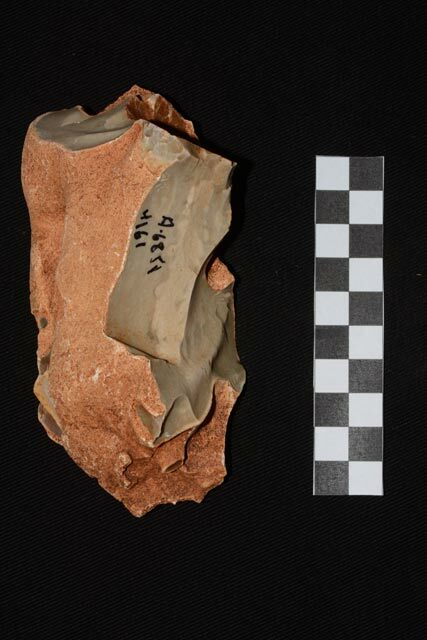 Similar tools from these periods were discovered in previous excavations at Giv‘at Rabbi. 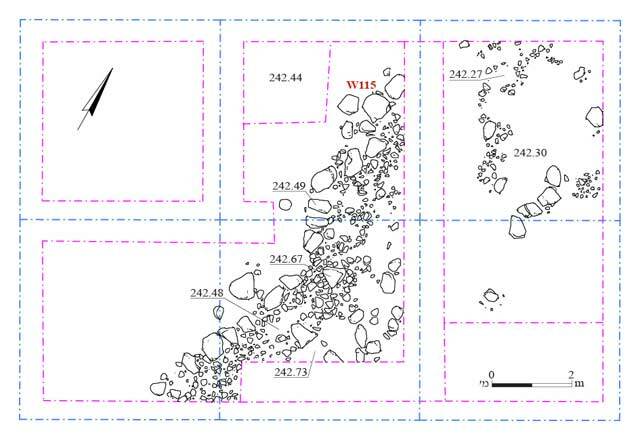 Nevertheless, findings from excavations conducted in the region attest to human activity in earlier periods as well. Barzilai O. and Milevski I. 2015. Neolithic Flint Workshops at Givʻat Rabi (East) in Lower Galilee. ‘Atiqot 82:63–83. Khalaily H. and Marder O. 2009. Giv‘at Rabbi (East), Survey. HA-ESI 121. Yaroshevich A. 2016. Giv‘at Rabbi. HA-ESI 128. 3. Wall 115, looking east. 4. Layer of black clay soil, looking north. 6. 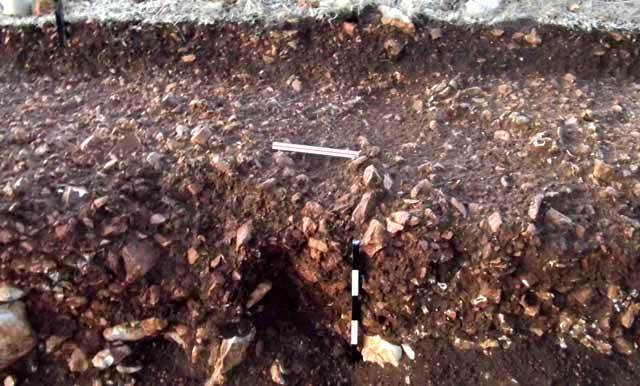 Layer of soil rich in flint items, looking south. 7. Debitage pit, looking south.